Today we are going to talk about something really intimate and Yes, it is none other than the push up bra that is an essential item for a Bride on her wedding day. A Push up Bra is a must have for any Brides whom are going to walk tall wearing it with her wedding gown. So much so that choosing a wedding gown is important, we would like to caution that choosing the correct push up bra is as important too. Recently, we just have had too many clients that came for the fitting of their pre-selected wedding gowns only to find that they have bought an incorrect size of their push up bra. A client share with us that she was told to buy a push up bra with a cup size that is big enough to cover her bust. While she is wearing a regular bra with Cup B size for her daily rounds, she was recommended a size of Cup D push up bra. Frankly, we find that this is incorrect and so we decided to share our knowledge here. When she brought her D Cup push up bra for the fitting, true enough it is a wrong size. Why do we say so? Wearing it with her tube shape wedding gown, this bigger cup size do not enhance the shape of her bustline but it gave a bulging effect instead. Because of the bigger cup size, it also gives a protruding look on her bustline and thus, the entire outlook of her wearing the wedding gown looks awkward. 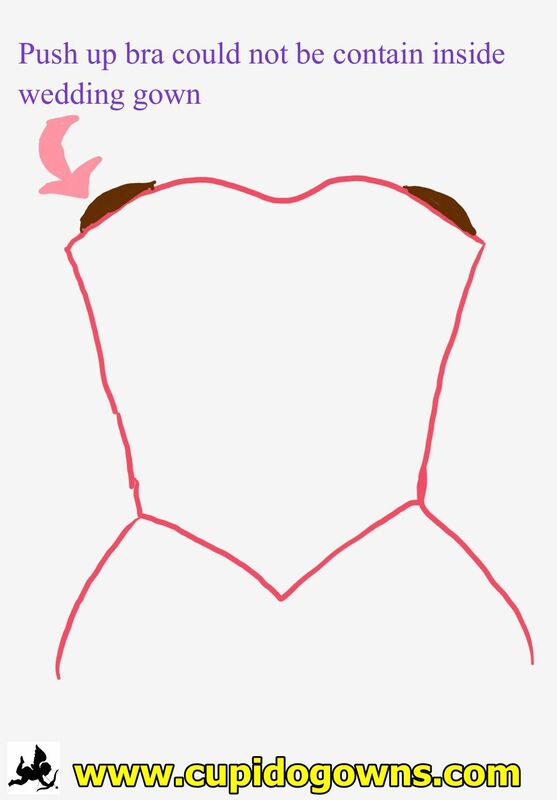 Furthermore, wearing a bigger cup size than what she is suppose to wear, the push up bra could not be contain inside the wedding gown, just like the image shown below. This client of ours is not exceptional as many of our other clients have the same thoughts that wearing a bigger cup means it will give a fuller bustline. So which is the correct push up bra to choose for your wedding gown? First of all, before brides step into a store to buy a push up bra, you have to first determine what is the cup size of your regular bra. The cup size of regular bras range from A to G cup in Singapore. The band of the regular bra is not important here. When you have determined your regular bra cup size, you should buy a push up bra that is 1 cup size smaller than your regular bra. For example, if you are wearing a C cup regular bra, you should be buying a B cup push up bra. Do note that cup sizes for push up bras range from A cup to E cup only. Thus, some of you may ask, “What if I am wearing an A cup regular bra? There is no other size that is smaller than A cup”. Our recommendation for you would be to buy an A cup padded push up bra to give a fuller bustline that will accentuate your shape wearing it with your wedding gown. 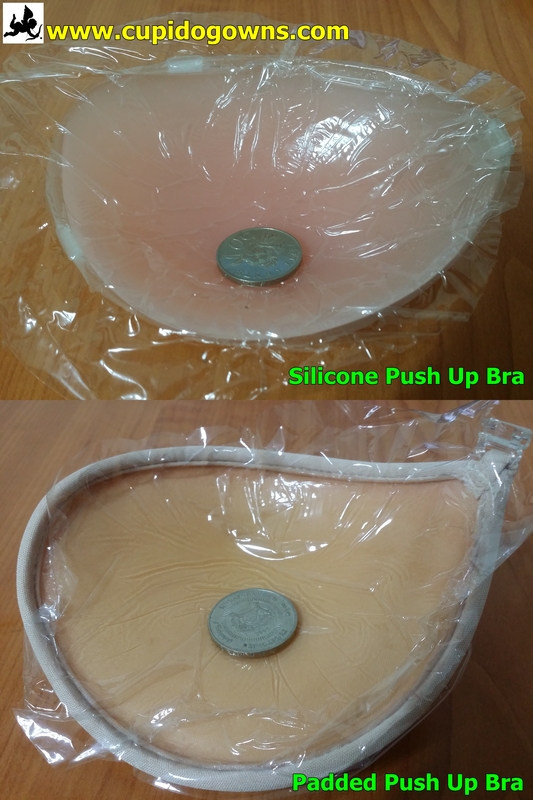 To show you the difference, we have shoot the image of the normal push up bra and the padded ones with a coin to show the difference in depth of the bras. A normal push up bra or silicone push up bra, is rounder and deeper on the inside whilst, the padded push up bra is thicker on the lower half of the bra. Both give the same effect of a deeper cleavage but the padded push up bra adds on to the fullness of bust. Are you scratching your head now? If you are looking for your dream wedding gown and have totally no idea which push up bra suits you best, contact us immediately. Our in-store wedding gown experts will be able give you advice on the proper selection of push up bras. Click on the following link http://www.cupidogowns.com/ to be amaze by what we have! We are a one stop Online Wedding Gowns Shop where you can find various unique designs of Wedding Gowns and Evening Gowns for your Wedding Day. All gowns published on our website are available physically in our showroom and we use only Top Quality materials and beads for our gowns.